While the whole nation celebrate the historic wedding of our beloved king Jigme Khesar Namgyal Wangchuk, on October 13, I have another reason to celebrate the day. Of course not so greater than life celebration which our people would be a part of, it’s the birthday of cousins. Yeah, the twin little girls, they are as excited as most of us for Royal Wedding. The excitement in these girls is so much that they can’t wait to celebrate their 11th birthday on the day, the lovely queen Jetsuen Pema gets crowned as the queen of Bhutan and finally the whole beautiful saga over the King’s marriage from gets a grand edge from where another page will be written in the wonderful history of our country. 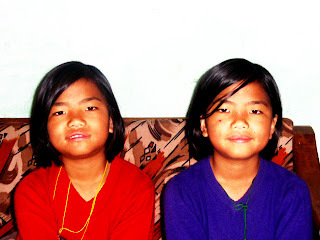 Samten Dema and Wangchuk Dema, there is so much similarities between these two girls except for their names which is not Nima or Dawa as we have for many other twins. For weeks, and even today, I couldn’t make the difference between who is Samten and who is Wangchuk. The little sister at house has a trick on how she makes the difference in these two elder sister of her. One has a mole and another doesn’t on the face, and these days, former is so much in removing the mole from her face. If her endeavor meets a better end, we are in danger of losing our trick. Being a part of the history that belongs to everyone of us is so much a privilege but to be part of ourselves which we can relate so much to the greater celebration, its another beautiful feeling.